ln partnership with Dining Services, CALS is serving up healthy, Virginia Tech-grown fare for students and diners campus-wide. Meet several of the forward-thinking individuals responsible for bringing this successful farm-to-campus venture full circle. ln partnership with Dining Services, CALS is serving up healthy, Virginia Tech-grown fare for students and diners campuswide. Meet several of the forward-thinking individuals responsible for bringing this successful farm-to-campus venture full circle. 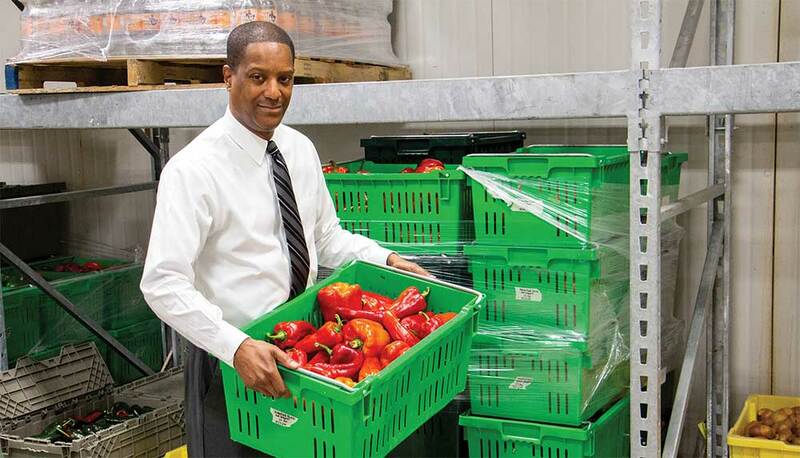 A small educational farm, Homefield is a partnership among CALS, the college's School of Plant and Environmental Sciences, and Virginia Tech Dining Services. 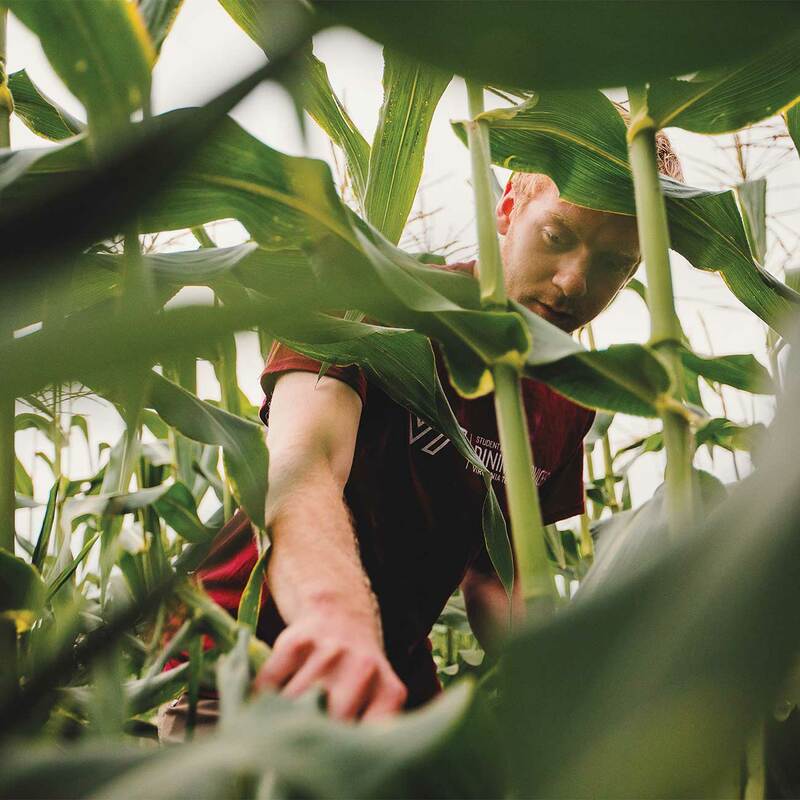 Through his sustainable agriculture practicum course and dining service menus, Hessler is a natural at getting students excited about growing and eating vegetables, from tomatoes and watermelon to carrots, power greens, fingerling potatoes, peppers, and beets. The farm's vegetable plots benefit from research conducted by faculty and graduate students from multiple departments, while local farmers, master gardeners, and school groups visit the 6-acre farm to learn about sustainable production practices and farm-to-campus dining. 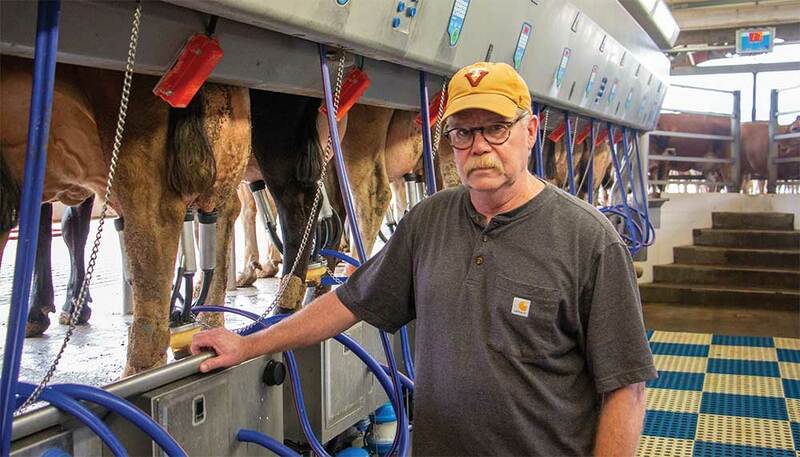 Brannock oversees students from three CALS departments and the Virginia-Maryland College of Veterinary Medicine, along with a herd of 270 milk cows at this spacious state-of-the-art facility. Milk is picked up every day by the Virginia Department of Corrections' agribusiness operation. Then, after pasteurization, roughly 1,000 gallons of whole and chocolate milk are returned each week to Virginia Tech, satisfying students at D2 and Deet's Place. The remainder is distributed to prisons around the state, while cream is sold to private businesses for Virginia residents to enjoy as cheese, yogurt, and butter. 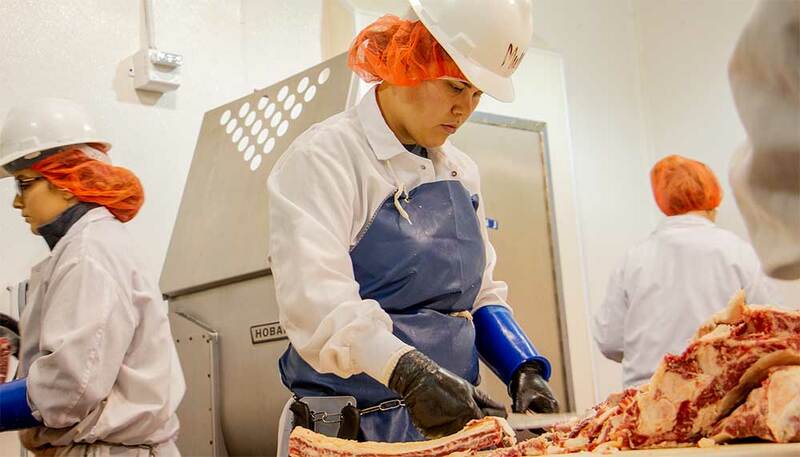 In this USDA-approved facility, Wicks and a team of students (pictured) process meat to teach students from the college's Department of Animal and Poultry Sciences, among other departments and colleges, and to help the industry make improvements. Cattle are sourced from the Kentland Farm Beef Center, while hogs and sheep come from Plantation Road; all are tagged and traceable through the entire process. Ground beef, pork shoulders, and other student favorites are shipped to the Southgate Food Center warehouse that distributes the meat to D2, Owens Food Court, and West End Market. Fresh meat and smoked jerky made on-site are sold at the Virginia Tech Meat Center store on Fridays, 2-5:30 p.m.
CALS and Dining Services have collaborated for nearly a decade, expanding a small Kentland Farm herb plot into what is now Homefield Farm. Today, chefs and production teams from Dining Services work with Hessler to identify produce needs that meet demand and minimize waste. 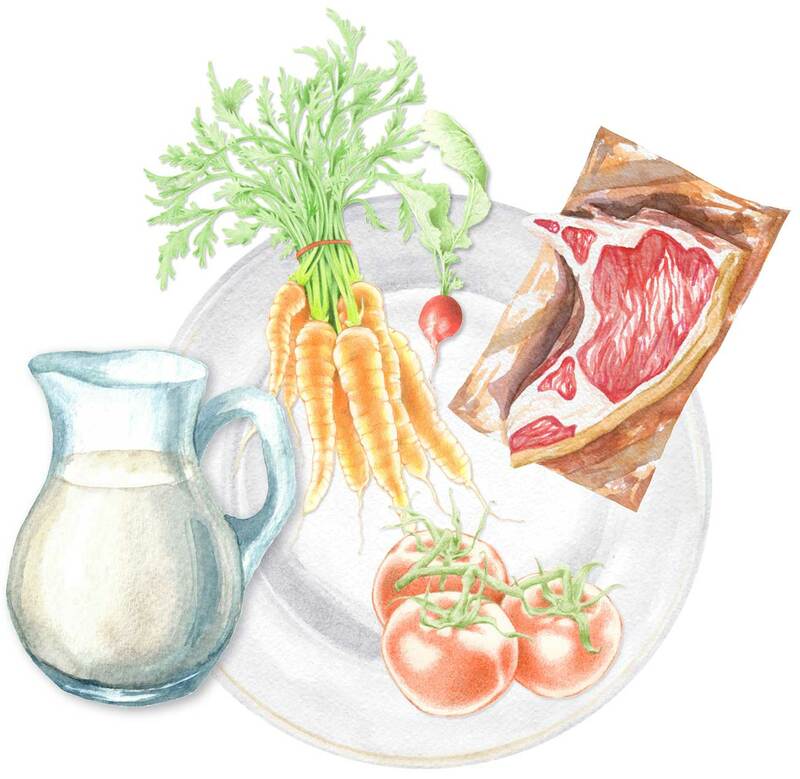 Similarly, the Meat Center offers its fresh cuts, while Kentland Farm's milk has become a D2 staple. Along with providing fresh meals, each partner in the university's farm-to-table venture is dedicated to experiential learning. Purcell and his colleagues educate students about this process through signage, promotional work, and outreach opportunities. To meet a growing demand for organic homegrown food, Dining Services opened Farms and Fields, the newest shop in the Owens Food Court. In October, Homefield Farm hosted a pop-up farm stand on campus, selling fresh vegetables grown and harvested by students.